Tallahassee Memorial HealthCare and Wolfson Children’s Hospital announced Monday the creation of the Tallahassee Memorial Children’s Emergency Center to address a growing need for pediatric treatment in the community. The children’s emergency center is located on the second floor of Tallahassee Memorial Emergency Center–Northeast off Thomasville Road. Over 10,000 pediatric patients are treated there annually. TMH president Mark O’Bryant said at a press conference that the new facility will be equipped to serve children whose only previous options were travel to Pensacola or Jacksonville. O’Bryant said the partnership will attract top pediatricians to the area, and better integrate “telemedicine,” which permits doctors to assess and treat patients remotely. The entire second floor of the emergency center is devoted to the newly renovated pediatric care facility. A wall just outside an elevator is decorated with cutouts of two youthful superheroes, “Ace” and “Tally,” with their arms outstretched in flight. Children leaving the facility will sport navy blue superhero capes like those worn by the mascots. 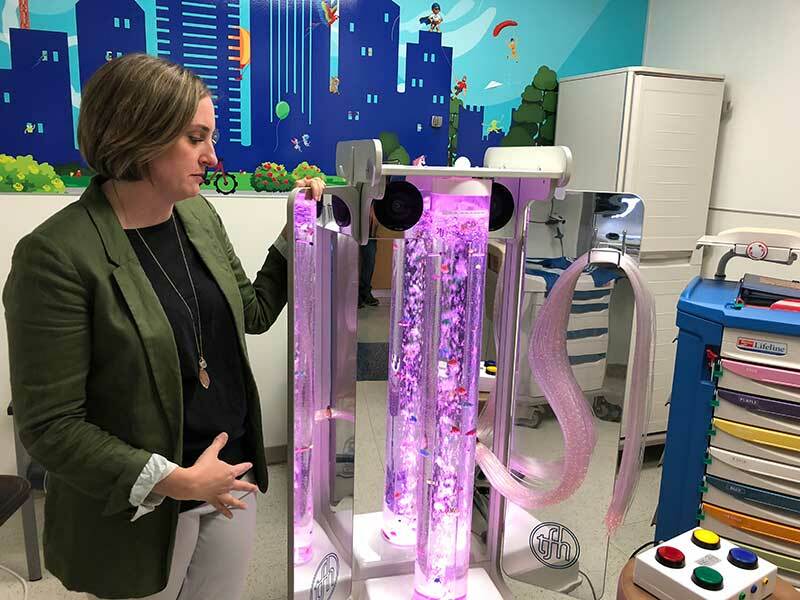 A multi-colored VECTA machine, a tube of bubbling water containing plastic fish, serves as a distraction in a patient room where children will be treated with IVs, given shots and administered other routine procedures. The machine is just one of the many technologically advanced displays the center has to keep kids’ minds off their treatment. A “Where’s Waldo?”-type game is available where young patients search for hidden characters in the murals on the hospital walls. Telemedicine involves Skype-like calls that connect doctors in Tallahassee with doctors in other cities. A doctor’s face peered from an iPad screen affixed to a rolling cart during the press tour. The doctor, located in Jacksonville, was participating in a video conference held to demonstrate how doctors will be able to interface across unlimited distances. Lauren Faison, administrator of population health and telemedicine at TMH, said the technology is so sensitive a doctor’s stethoscope in Tallahassee can transmit information to the doctor on screen. Faison said both children and parents are becoming more and more receptive to the integration of medicine and computer technologies. “(Children) are some of the best telemedicine patients. They love to see themselves on camera,” said Faison. O’Bryant described the new emergency center as a step in an evolving partnership between TMH and Wolfson, two facilities already looking forward to further advancements in their relationship.